I was really pleased to find out about these three products, branded as Adaptiltm which is a registered trademark of Ceva Santé Animale. All three contain the same active ingredient, a natural substance called Dog Appeasing Pheromone. DAP (or D.A.P.) is an acronym or short form of this name. DAP is something that all puppies will get naturally from their mothers in the first few weeks of their lives as it is secreted in the milk. It works on adult dogs to give them back the same reassurance and comfort they got as little puppies. It is really nice to think that there is an effective natural alternative to sedatives and other medicines - and that instead of giving medication to your beloved pet to calm him, you could be giving him the equivalent of a hug from his Mom! Scientists have managed to manufacture a copy of this natural dog appeasing pheromone so that these products can be manufactured in large quantities. Its use can avoid the need for sedatives and other medications which is not only preferable but also more cost effective. It is only effective on dogs and so you need not have any fear that it will affect adults or children in any way. Nor does it affect any other pets you have – cats for example are entirely unaffected by it. 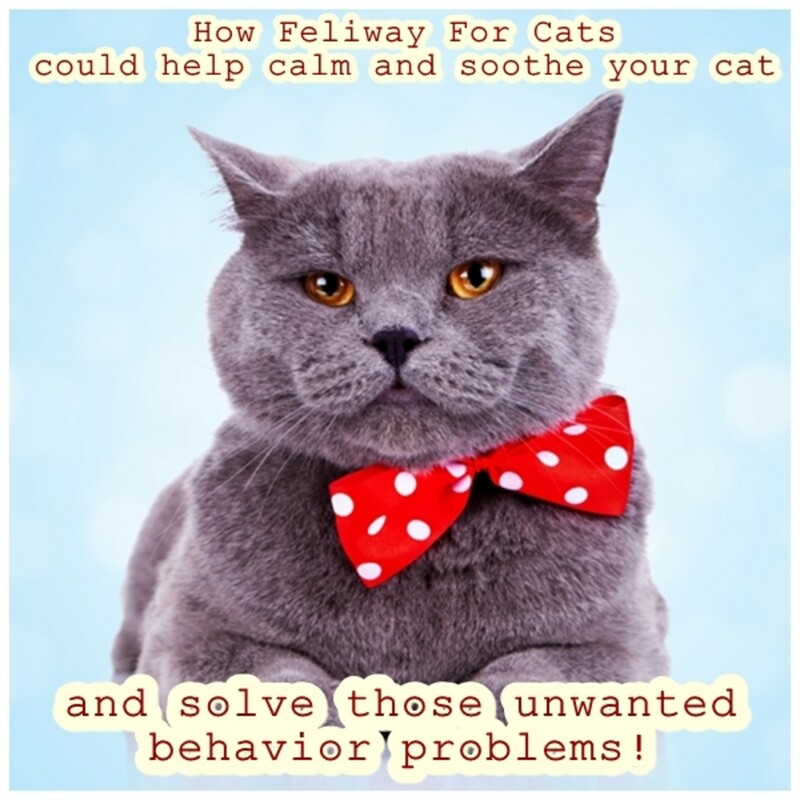 For cats who exhibit behaviors caused by stressful situations, check out my HubPages article on Feliway Diffuser and Spray. The Adaptil diffuser plugs into an electric socket in the same way you would use one of the very popular plug-in air freshener products. It works best if you use it in the room where your dog spends most of his time indoors, probably where his bed or basket is. It will be effective in rooms with a floor area of up to 70 m² and works continuously to circulate DAP dog appeasing pheromone in the air. The contents of a diffuser lasts for about four weeks and refills are available. Each base unit can have five refills before the manufacturers suggest you replace it with a new base unit. As mentioned, it doesn’t have any effect on people, nor is there any detectable smell from the product. To make sure it is most effective, make sure your diffuser is plugged into a socket where air can circulate freely around it (i.e., not behind furniture). 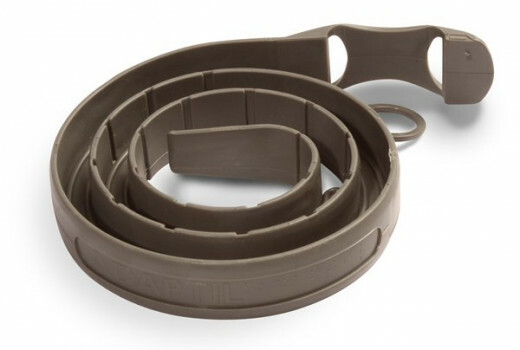 Choose The Right Sized DAP Collar! Adaptiltm collars are recommended by the Blue Cross, The Dog’s Trust and the RSPCA in the UK. 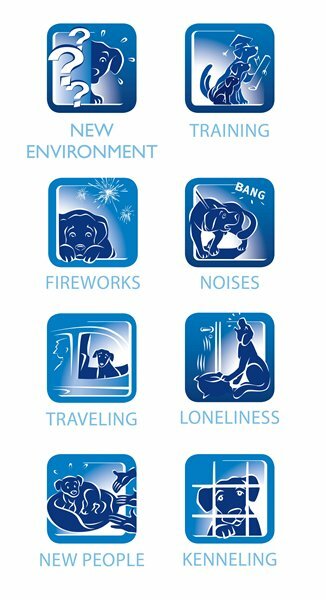 They can be used for dogs suffering from stress and can be especially helpful in dogs where stress is causing behavioural problems because the dog has the comfort and reassurance imparted by the appeasing pheromone released from the collar 24/7. Each DAP collar will last for four weeks and does not have any sort of sedative or other unwanted effect on your dog. 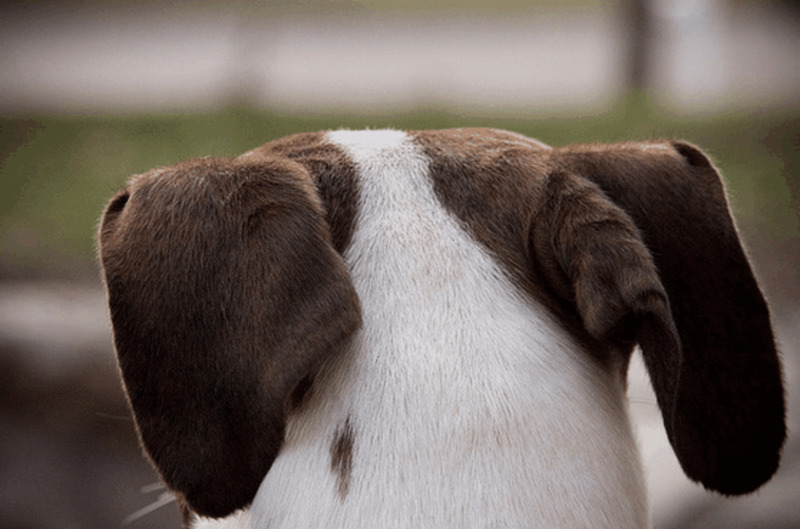 Ensure that you choose the right sized Adaptil collar for your dog as it is very important that the material of the collar is in close contact with your dog’s skin. Just choose the appropriate size, (choose either the medium to large dog or the small dogs and puppies size), adjust it to fit and simply cut off the surplus with ordinary scissors. 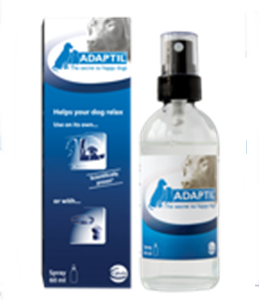 The third product in the range from Adaptil (tm) is the DAP spray. This is a short acting product, unlike the diffuser or the collar and is designed to give emergency relief in stressful situations. For example it can be put onto your pet’s bedding to comfort him if he is sick, injured or recovering from surgery. It can be put in his traveling crate if he does not like car journeys. You could put it onto his blanket if you are having a family party either at home or at a relative’s house where you feel the noise and excitement might distress him. The only thing you must not do with it is to spray it directly onto your dog or use it near a dog’s face. 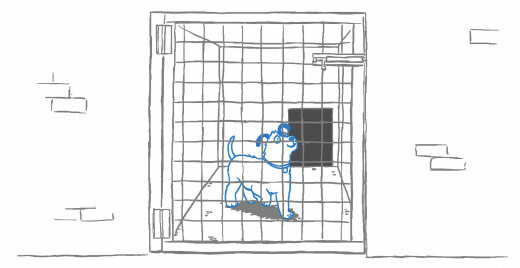 Just use the spray around fifteen minutes before you want your pet to go to his bed or into his traveling crate. 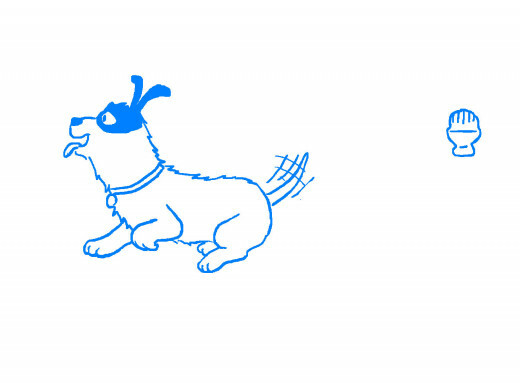 Using the spray as directed, will ensure that your pet gets soothing comfort from the dog appeasing pheromone released. Whilst it is only effective for about three hours or so, you can repeat the application if necessary. With our own dog, Bandit, a Jack Russell who came to us from the local animal rescue shelter, it is loud noises such as from, thunder, fireworks, etc. (You can see him as a puppy in the photo at the bottom of the page). Any sort of upheaval, like if we are decorating a room of our home, packing to go on holiday, sorting out a cupboard will also have him exhibiting the classic stress behaviour of ears down, tail tucked between the legs, hiding under the bed and having a tummy upset. 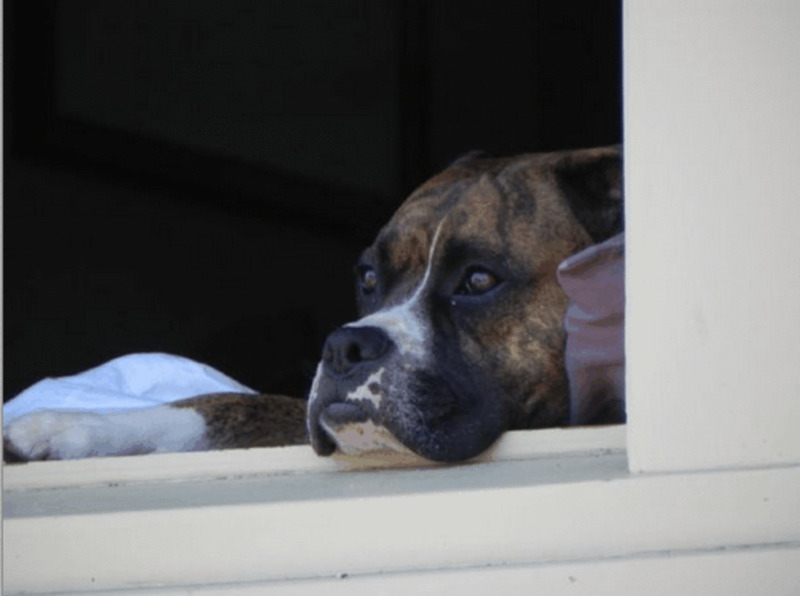 There are many other stress symptoms that dogs exhibit and if you have an affected dog, you will certainly know what they are. My neighbour used to get sedatives from the vet each year in November around the time when lots of fireworks are going off in the UK. Her little dog was terrified of the loud bangs and noises outside and would cower in a corner and no amount of comforting or cuddling could reassure him that everything was ok.
DAP products from Adaptil™ can bring that reassurance to a dog by simply providing the natural appeasing pheromone that would have brought comfort as a puppy. 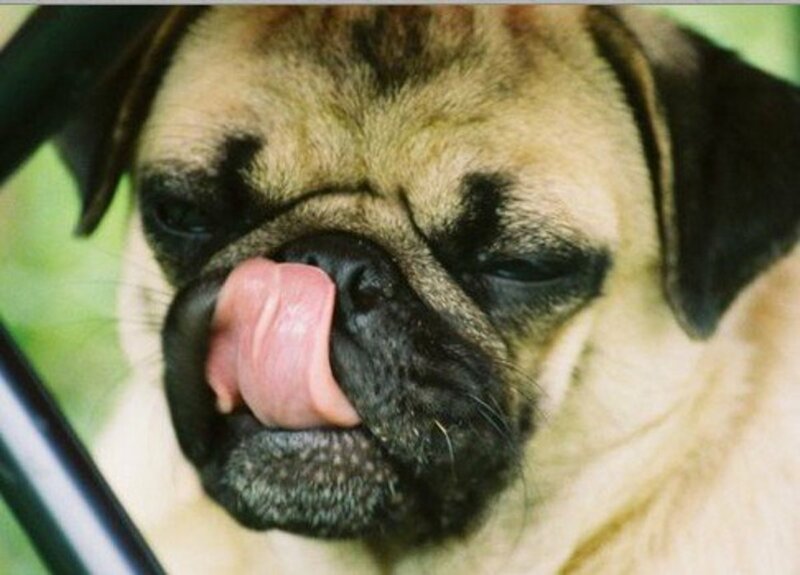 Adaptil Can Help Restore The Reassurance and Comfort Your Dog Got From His Mum! 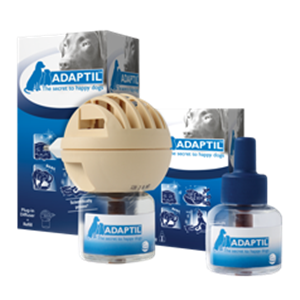 I wrote to the manufacturers of Adaptiltm when I was researching and I got some very helpful information back from Elizabeth Hodgkins from Ceva. 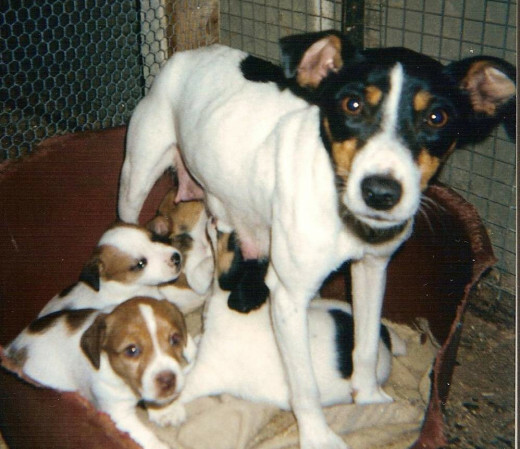 I must thank her and her colleagues for kindly supplying all the images for me to use in this article and for her explanation of how Adaptil is able to communicate to the dog that it is safe and secure, just as it was during those first few days and weeks of life when it was with its mother. The video (above, right) explains about this and I hope you find it as helpful as I did. Calm Your Dog With The Comfort He Got From His Mom! 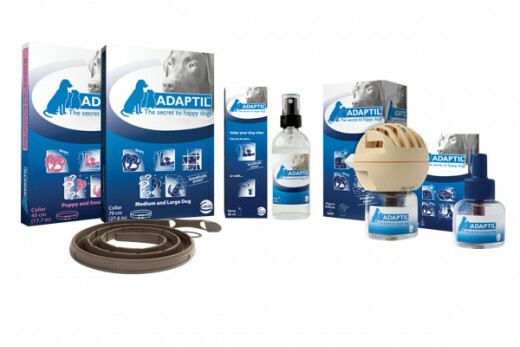 If you have a nervous, anxious or highly strung dog, if your dog finds some situations very stressful and is exhibiting behavioral problems as a result, why not try one of the products in the Adaptiltm range? Particularly as they are not expensive and come so highly recommended by vets and animal charities. 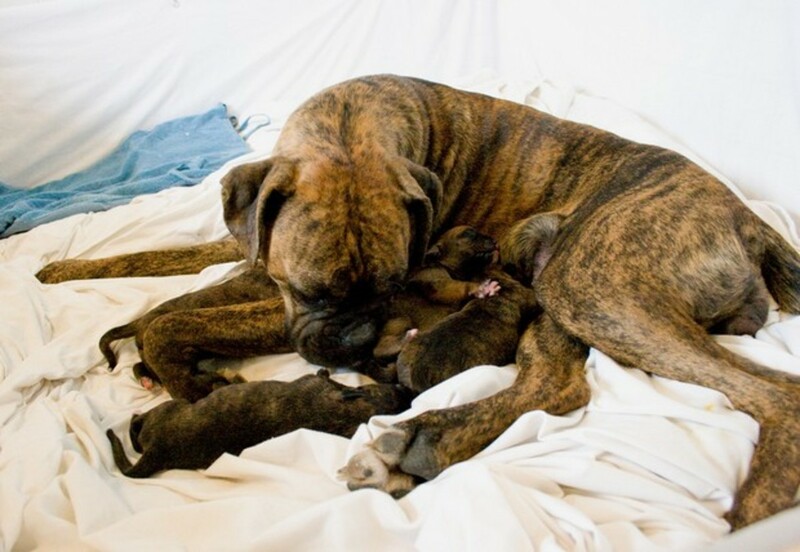 It is especially nice to know that these products contain the same natural dog appeasing pheromone as produced by nursing mother dogs to comfort their puppies – how many times have we felt that we could do with a hug from our Mom when faced with a stressful situation? Whichever you choose, the Adaptil collar, DAP spray or diffuser will comfort and reassure your dog when he needs it the most. @Schoolmom24, the Adaptil products are recommended for the stress caused by fireworks. I would definitely recommend you try them around that time, particularly the diffuser and add the spray as a 'top up'. 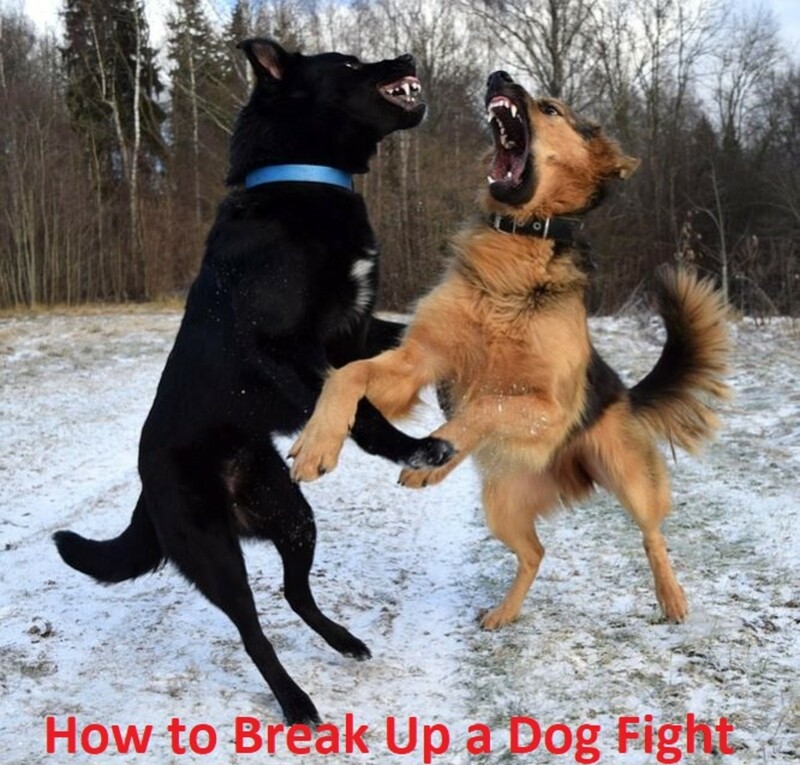 Hope it helps your dog - it is horrible to see them frightened. Wow, this is a great alternative to sedatives. We haven't actually used anything with our dog yet, but around 4th of July here, she is completely stressed out from all the fireworks! I will have to look into this! Thanks @Dreamhowl, I really appreciate your comment and glad to know you found the information useful and hopefully of benefit to your customers too. Thank you too, @prokidwriter I would be very interested to know other readers' comments too about the different situations where they have found one of these products of particular benefit. What a fantastic hub! We had a very high strung pet that would have benefitted from this. Thanks for such great information! I've always wondered about the effectiveness of these products. I've had customers ask me if I knew how well the diffusers, collars or sprays worked. Now I feel like I will have more information to provide. Voted up!